John Scott (Convention on Biological Diversity Secretariat) spoke with the Community Palli participants about the engagement of local and indigenous communities with the CBD. Among the opportunities he mentioned was joining IIFB drafting groups focused on specific issues within the CoP agenda, and becoming involved in the NGO Forum or the CBD Alliance. Discussions related to indigenous and local communities – including the repatriation of information, knowledge and associated cultural property, Access and Benefit Sharing, and the use of Free, Prior and Informed Consent – are also discussed in larger contact groups. 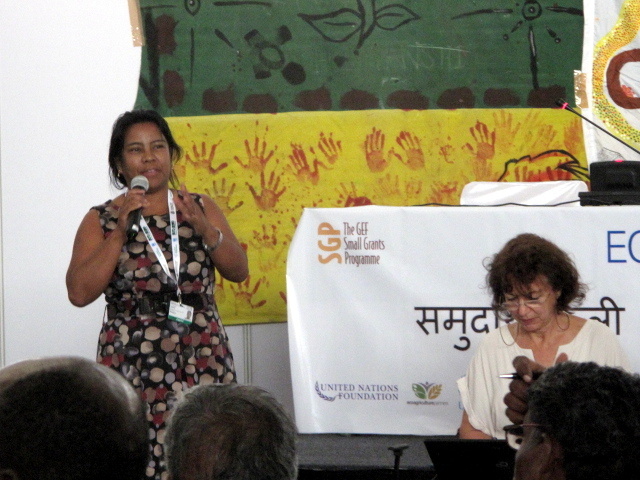 The following issues were being discussed during the CoP: modifying the language of the ILC declaration so that “indigenous and local communities” is changed to “indigenous peoples and local communities”; and declaring an International Day for Local Communities. Finally Mr. Scott clarified that new issues could not be added to the CoP agenda, but that these issues could be introduced at a subsidiary level in between CoPs. 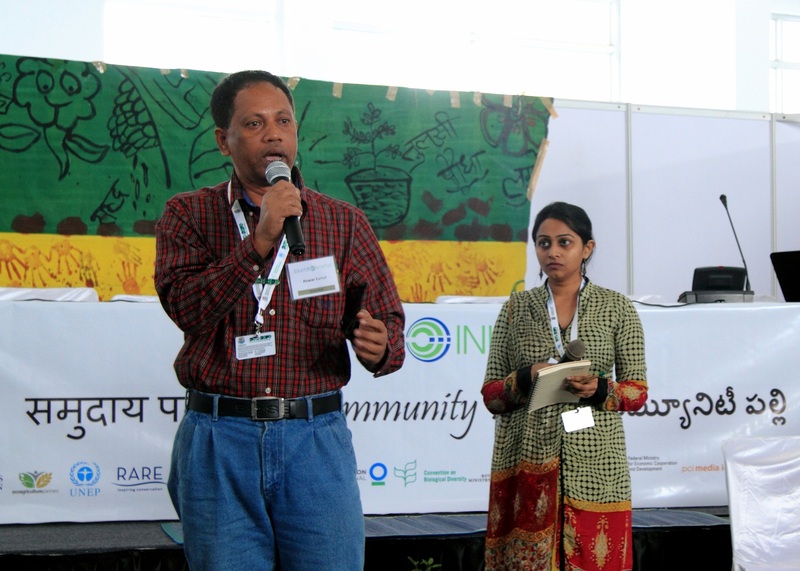 The third of the Community Palli’s thematic workshops focused on relationships between protected areas and local communities, based on first-hand experiences from India, Bangladesh, Sri Lanka, and Indonesia. 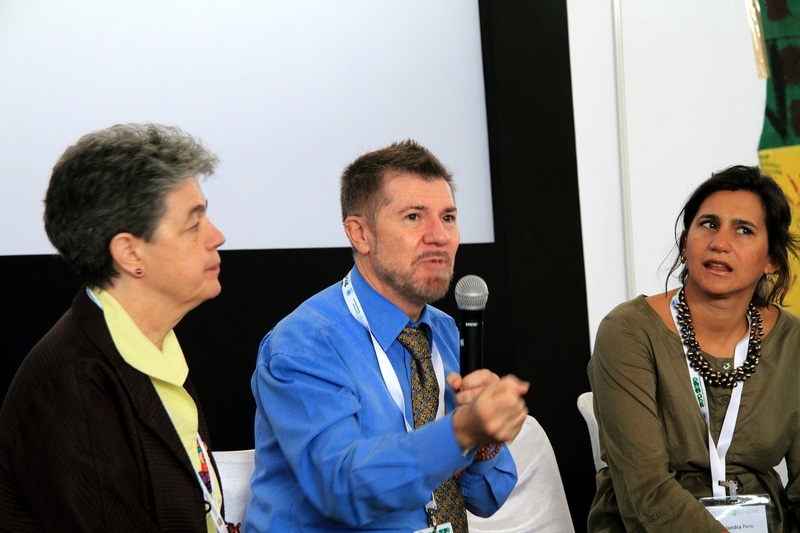 The session was moderated by Jamie Ervin, UNDP Senior Advisor on Protected Areas, who opened proceedings by providing an overview of relevant international conventions and frameworks relating to protected area management. She also posed five discussion questions for speakers to consider during their presentations: What motivates local conservation of sites? What benefits can accrue to local people as a result of protected area management? 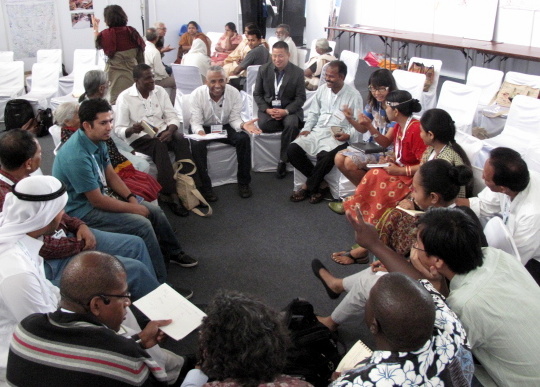 What communication and advocacy strategies are used by local initiatives in securing rights to manage areas? How can their approaches be replicated? What role can local government play in facilitating management of protected areas by local communities? The case of Chunoti Co-management Committee, in which local communities participate in a landmark co-management arrangement to conserve a wildlife reserve in Bangladesh, is indicative of the benefits to biodiversity and local wellbeing that are possible from allowing local participation in protected area management. Anwar Kamal and Reema Islam described how the initiative has worked with international partners (including USAID and GIZ) to introduce alternative income-generating activities that reduce pressures within community-managed buffer zones surrounding the Chunoti Wildlife Sanctuary. The group has also worked closely with local government authorities to reduce logging within the sanctuary’s core zone – as a result, elephants have begun returning to the area for the first time in 30 years. Since 2008, the approach has been replicated in twenty-five other sites – local communities face the ongoing challenge, however, of migration to the area that increases pressure on the protected area. Shashwat is an environmental NGO working in the state of Maharashtra to confront a range of challenges facing tribal communities. These include displacement by the construction of Dimbhe Dam and exclusion from wildlife reserves. Shashwat works to ensure that local people can continue to live harmoniously alongside nature – its approaches include improving the productivity of farming land around the reservoir and on hillsides, protecting forests from commercial interests, and targeted advocacy on the part of tribal groups. Some successful strategies have included organizing annual wildlife sanctuary conferences since 1991, holding a march on the theme ‘Save Forests, Save Life’ in 1995, and, since 2002, the involvement of community members in a participatory research venture, the People’s Forest Research Institute, that documents local conservation of flora and fauna. Partly as a result of these strategies, state forest legislation was amended in 2006. One of the tenets of Shashwat’s work is the principle that rural communities can co-exist in harmony with wildlife while preserving their traditional ways of life. This is the driving influence behind the work of the Wildlife Conservation Society in Sri Lanka, which works to reduce human-wildlife conflict around the country’s protected areas and wildlife corridors. In particular, the initiative has sought to reduce conflict between farming communities and elephants. 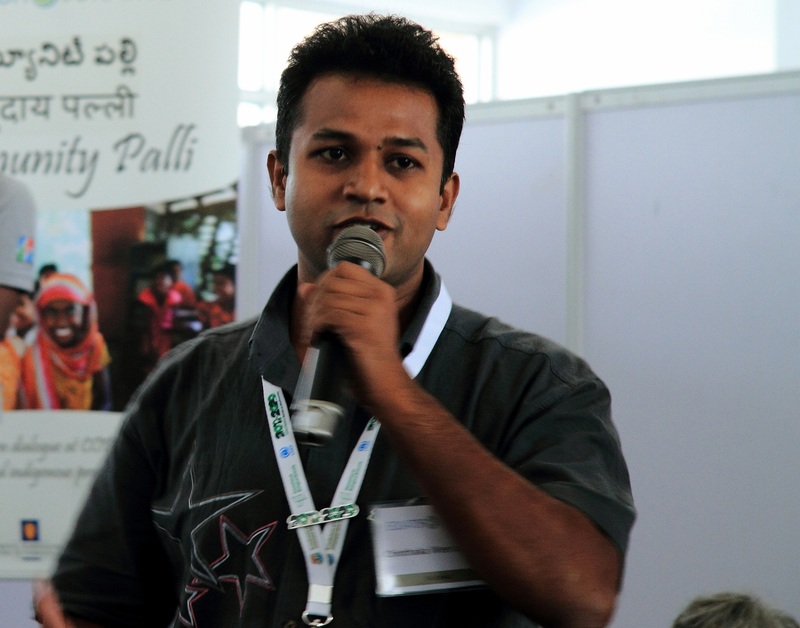 Chinthaka Weerasinghe presented on measures such as ‘fencing in’ rural communities using electric fences, rather than ‘fencing out’ wildlife, as well as the use of innovative technologies to alert farmers to crop-raiding. The long-term aim of the project is to change agricultural patterns (namely slash-and-burn farming) that impact negatively on elephant corridors, and therefore demonstrating that rural livelihoods can be maintained without encroaching on elephant habitats. The final case came from Indonesia, where the Organization for the Indigenous Women of Ngata Toro Village (OPANT) has played a leading role in demonstrating the viability of a rural community living within a protected area. The indigenous peoples of Ngata Toro Village live in an enclave of Lore Lindu National Park, a UNESCO Biosphere Reserve located on the Indonesian island of Sulawesi. The group was successful in having 18,000 hectares of their customary lands recognized by the government in 2001; since then, they have conducted traditional livelihood activities such as extraction of non-timber forest products like bamboo and rattan, and small-scale cultivation of coffee and cacao, while protecting an area of primary forest. The session concluded by breaking into two groups in which Community Palli participants discussed the key success elements in each of the four cases. Capacity building for communities, their involvement as stakeholders in the initial stages of formal conservation efforts, and respect for traditional knowledge were all identified as critical components of designing equitable models of protected area management. Protected Area Governance in India – Where do we stand in terms of tenure, relocation, and possibilities of coexistence? Since the 1972 Wildlife Protection Act, protected areas in India have vastly increased in number. There are currently 669 such areas. Some of India’s most marginalized and vulnerable communities depend on these areas for their livelihoods – while India is striving to meet its obligations under the CBD, the rights of some of these local communities are not being sufficiently recognized. This session explored prevailing trends in protected area policy and how these affect local communities, echoing many of the sentiments from the morning’s workshop. Presenters described a number of areas of conflict, including the creation of tiger reserves (since 2006) as a means of protecting these endangered species and as ecotourism sites. Forest areas previously marked as buffer zones are now being given strict protection, excluding local sustainable use and ignoring the provisions of the Community Forest Rights Act (2011). In some cases this has entailed forced relocation of communities. Another recent development discussed during the workshop that has negatively impacted rural communities is the implementation of fire suppression policies. A long history of co-existence between communities, forest habitats, and wildlife has been discarded in favour of top-down conservation. Fire suppression has even led to more destruction through the introduction of invasive plant species such as lantana. These interventions are compounded by the approaches of some state forest departments. Protected area managers are appointed despite not possessing knowledge of the unique ecologies of the areas they are protecting; meanwhile, local knowledge goes under-utilized. The workshop discussion explored international perspectives on these issues, including examples from Bangladesh and from IUCN frameworks for natural resource governance. 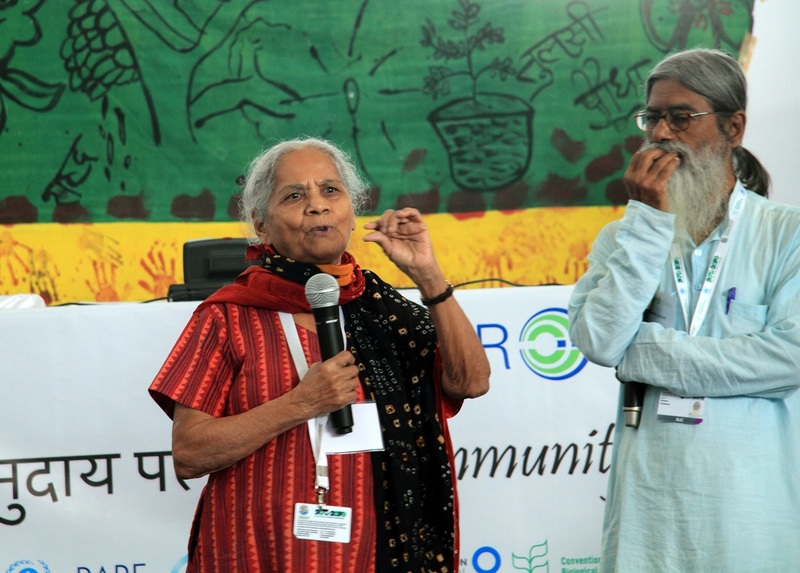 The imposition of one-size-fits-all, top-down management policies was noted by a representative of WWF-India as a failed approach: local communities need situation-specific policies. Another responder from the state of Gujarat described how the restoration of traditional grassland management systems can be a more effective tool for sustainable resource management: if communities have been managing and conserving forests for generations, why is the government spending so much money to override that? Other suggestions included working to protect villagers from property destruction by wildlife rather than forcing the relocation of communities. The presenters concluded by emphasizing the need for situated local knowledge in conservation to inform site-specific measures: for example, the use of fire is the best tool in some areas but devastating in others. The power that governments are wielding and usurping is immense: REDD+, ecotourism, and expanded protected areas are being used as “green grabs” in the name of the environment. 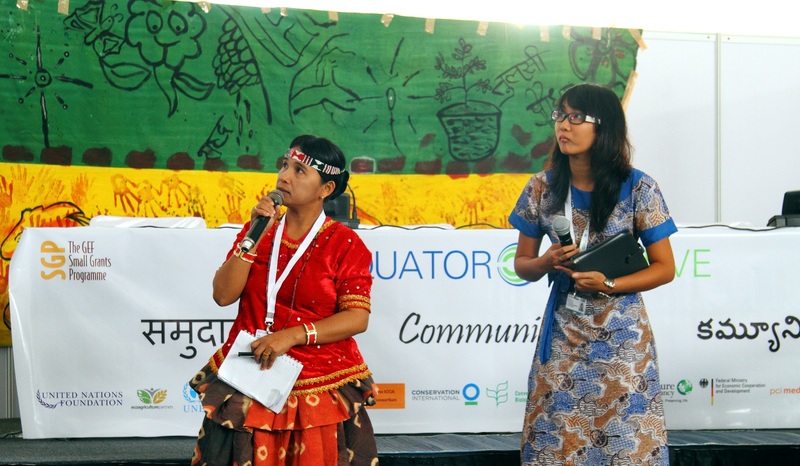 The ICCA Consortium led a workshop on the role of federations and coalitions of indigenous peoples and local communities in protecting the natural and cultural values of their territories and conserved areas. 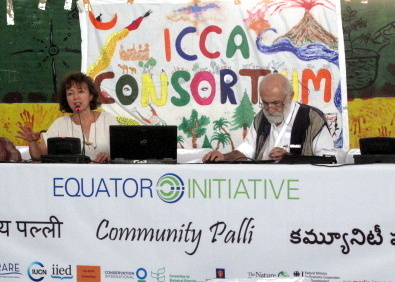 The session highlighted a number of recent achievements by country-level coalitions of groups working on ICCA issues, including: the Manila Declaration of March 2012, which was signed by the largest coalition of indigenous peoples in the Philippines; the Brugerd Declaration on autonomous governance of ancestral territories and natural biodiversity resources by the Union of Indigenous Nomadic Tribes of Iran (May 2012); and the Anja Declaration, also of May 2012, developed with the contribution of 482 traditional communities in Madagascar. 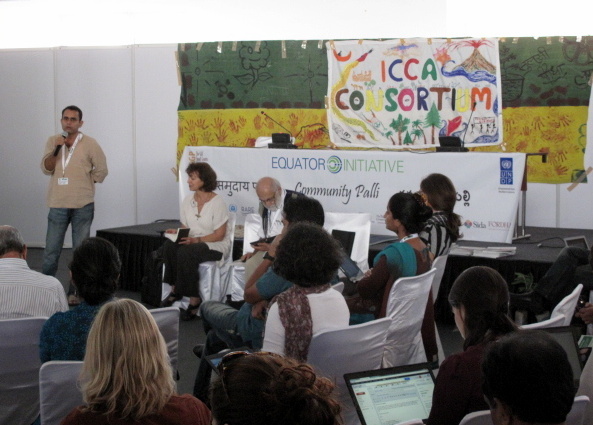 The experiences of the ICCA Network in Nepal and of community networks in India and several Latin American countries were also explored. The session brought together representatives from the ICCA Consortium, GEF-Small Grants Programme, Koalisyon Ng Katutubo at Samahan Ng Pilipinas (KASAPI), Union of Indigenous Nomadic Tribes of Iran (UNINOMAD), Tafo Mihaavo, Kalpavriksh, CoopeSolidar, The Christensen Fund and the Equator Initiative, among many other international contributors. Delfin Ganapin, Global Manager of the GEF Small Grants Programme, concluded the workshop by acknowledging that where federations have been established (such as The Philippines, Madagascar, or Nepal), it is typically an indicator of the maturity of the country’s indigenous and local communities, and of the struggles they have gone through over time. Learning from these struggles can be instructive for countries at an earlier stage in this process. Establishing federations is not a standard formula for each country, but should be determined at every step by individual countries and their indigenous peoples and local communities. Above all, federations are an attempt to balance political power – they will therefore provoke reactions from parties opposed to their aims. Mr. Ganapin congratulated the successful cases presented during the workshop, and proposed a role for the United Nations in reminding governments of their commitments to international conventions that support this work. The Nagoya Protocol requires countries to support the development of community protocols for ABS by indigenous and local communities. This side-event launched a new IIED publication, Biodiversity and culture: Exploring community protocols, rights and consent, published in association with Natural Justice, Union for Ethical Biotrade, COMPAS and Kalpavriksh India. The publication reviews 14 cases of Biocultural Community Protocols (BCPs) and Free, Prior and Informed Consent (FPIC) in Asia, Latin America and Africa. Lessons from these cases were presented during the session, alongside three case studies on the development of biocultural community protocols in different settings: pastoralists in India (presented by Ilse Köhler-Rollefson, LIFE Network), community conservation of sacred groves in Tanchara, Ghana (presented by Bas Verschuuren, of the Sacred Natural Sites Initiative/COMPAS) and the case of Ethical Biotrade (presented by Maria Julia Oliva, Senior Legal and Policy Coordinator). Expert panelists from Natural Justice and the Indian NGO Anthra concluded the session by identifying some of the challenges ahead for BCPs and FPIC and related participatory processes.